And no, I don’t mean how big Beijing is. And Beijing is plenty big: the metropolitan area is about the same size as London, but with a population numbering a million more (12.7m). But actually, for an expat, Beijing can be surprisingly small. 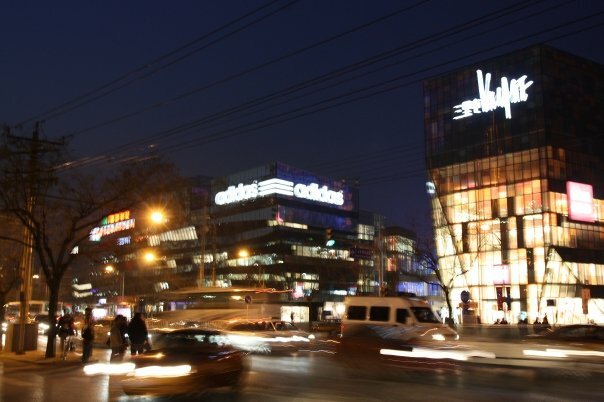 The main areas where foreigners hang out in Beijing are Wudaokou, Sanlitun and Gulou. The first is a university area, where overseas students from the US, England, Korea and elsewhere hang. Sanlitun is an upmarket shopping area featuring a huge Apple store and expensive brands, as well as plenty of dives, clubs and bars. It’s very popular with expats. Finally, Gulou is a trendy area liked by creative types, where Beijing’s traditional alleys (called ‘hutongs’ in Mandarin) are still in place. Nestled in these alleyways are cool little bars and cafes, and music venues such as the legendary Mao Livehouse and DJ-heavy Dada. These three places are vacuums into which foreign residents of Beijing invariably get sucked. They are the go-to places, the natural recourse. But it can feel humdrum & cliche telling a taxi driver to take you to Sanlitun the Nth time. Beijing is a pretty cheap place to live, even though it’s pricier than most the rest of China. I can eat well for less than £5 a day. Bottles of beer are less than a pound. Buses are four pence(!) a journey. Subway trips are 20p. So spending becomes automatic. Cash flows through your hands like water. You end up eating out all the time, treating yourself to snacks, going to lavish restaurants, buying clothes like it’s nothing. Beijing becomes an arena to give away your cash for stuff. It’s a ‘communist’ country by the way. This is another budgeting thing. Transport isn’t so great in Beijing despite its cheapness. Subway stations are not so numerous and bus routes can be elephantine. Taxis are the easiest and relatively inexpensive. But it all adds up and taking taxis regularly can be a significant drain on finances. It is everywhere. In the air. On the floor. In your pocket. Up your nose. On your clothes. Smeared in your hair. Layering over your face. Inside your mouth. Invisibly on your food. It’s a mixture of sand blown in from the northern Mongol deserts, brick dust (demolition and building is rampant) and general pollution (car fumes, smoke etc). Let’s not even talk about the cancerous air pollution… *It isn’t as apocalyptic as this description may seem, but it does go everywhere. Didn’t you already say this was a bad thing? Yes I did, but things can be contradictory okay? This is China we’re talking about. Where you can buy tons of stuff but kids are schooled in Marxist theory. Beijing is small enough so it can feel like a village, where you can bump into that pretty girl who you’ve noticed but can’t ever seem to talk to again and again and again. And large enough that you can find weird, soothing, crazy, peaceful places too. This ones for the journos. You can quite easily bump into local luminaries. If you’re at a popular dive, you’ll probably be glancing over various entrepreneurs, star writers and local ‘celebs’. They’re all very approachable and easy to get in touch with. Want to know what’s cool in Beijing? Where to go, what to do and what to eat? You are well served. There are four big expat publications here all catering to that service: The Beijinger, TimeOut, City Weekend, That’s Beijing. Not too mention countless blogs and websites. It’s all free too. Beijing’s grapevine is a generous bounty. Because the foreigners here tend to be a self-selecting bunch it means you get to meet interesting, lively, thoughtful, intelligent and bold people. Because why else would you decide to come here if you weren’t crazy enough to leave your comfy life back home for this dusty, cash-sucking city? Chinese girls are a totally different story and one we can save for a possible future.